The great American road trip is the stuff of legend from sea to shining sea every spring in America. Trips to the beach, Disneyland, Yellowstone, Mount Rushmore and more are taking place this season as families pack up the car to hit the road. Perhaps none more famous than the hilarious National Lampoonâs Family Vacation, long car rides with the family can really test a familyâs cohesion. Nothing tests that more than poor hygiene and smelly feet trapped in a minivan for 12 hours a day. Fret not, as an impromptu road trip or planned vacation doesnât have to mean substandard hygiene. Convenience Kits International offers the go to solution for hygiene on the go and there is a little something for every family member at the ready. Not to belittle the dads out there, but moms know their familyâs hygiene needs and certainly their shortcomings. So if you are a mom in charge of planning the familyâs rations before a trip, you might want to consider going with a fully customizable kit. Building your custom travel kit is remarkably easy and allows you to customize each kit to each individualâs need. You can choose the size of the bag and fill it with your choice of shampoos, deodorants, body wash and more. So in this case, there is no need to nag the kids, or yes even the husband, to see if they remembered to pack any particular item to make the trip a little less musty. For a remarkably cheap price, simply order it completed and when they complain they are out of deodorant you can just hand it over to them. No excuses. No fuss and most importantly, no musty teenagers filling up the back seats. Mom knows best and if thatâs you, then we recommend you fully customize. That being said, momâs got plenty on her plate before a long road trip and she can use a little help every now and then. Thatâs why we offer fully completed kits that are just ready for a click and order. Moreover, if you should find yourself flying instead of on the the road these kits meet all TSA size requirements. 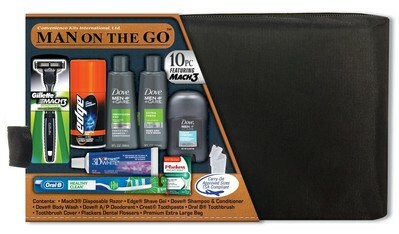 So if you have a musty teenage boy on the road with you, then just order this AXE 9pc Extreme Mini Premium Kit. From deodorant to toothpaste to even a handy set of Dude Wipes, this kit has everything you need for the smelly teenage boy experience. In addition, letâs not forget about little baby. Hopefully the only one on the trip not quite potty trained yet, babies need regular baths over the course of a family vacation. Rather than scurry through your baby bath basket at home, just order this pre-assembled Johnson & Johnson 10 pc Baby Travel Bag. Simple, affordable, and even comes a little rubber ducky to keep the little baby entertained during bath time. There is absolutely no reason to stress about the great American road trip this spring. Families have regretted wasting money on all sorts of items in life, but they rarely if ever regret the experiences forged together on vacation. Not even teenage musk can ruin these memories. Keep it simple and smelling fresh for your family this spring with any of the hygiene solutions youâll find here at Convenience Kits International. Pack Light. Pack Smart. Travel On. March is just one of those months where you have no idea what to expect. Between March Madness and the old cliche âMarch comes in like a lion and out like a lamb,â it really is an unpredictable time of year. You can go from a snowstorm to a nice 70-degree day. But one thing is certain about this rather hectic time of year: SPRING BREAK! Whip out your hot pink ski masks and get ready to party in paradise like James Franco. Whether youâre staying Stateside in Miami or dusting off your passport to hit up Cancun with your sorority sisters, thereâs a few things to keep in mind before jetting off. Apologies in advance if I come across as a grandma in this article, but my hope is that by reading this, youâll have an even better spring break with as many Natty Lights as your heart desires. When I was in college, I went on a spring break in Cancun, 2 in Miami for Ultra Music Festival and 1 in the Dominican Republic. These tips apply to those destinations and then some. So without further ado, here are 5 things I wish I knew before going on spring break. Party hard but party responsibly! Always get travel insurance: This is seriously a no-brainer and I canât believe so many people risk traveling without it. If youâre staying in the US, you should be okay on your regular health insurance plan (or maybe mom and dadâs? Thanks guys!). But as soon as you cross into international waters, the stakes are higher if you have an accident of any kind. This includes the crazy high bill for getting your stomach pumped after a night of drinking too much or riding in an ambulance. Drunk people do all kinds of dumb things - you wouldnât want to pay $1,000s just for a broken toe, would you? Try World Nomads - theyâre affordable and will cover you for a vacation in most destinations around the world. Get a travelerâs credit card. Theyâre so useful because they donât have foreign transaction fees. Because you pay the going market rate, youâll save hundreds of dollars in the end. Cards that do tack on a fee for international purchases often charge an extra 2%, sometimes as high as %10 percent from local vendors. It sounds small but it really adds up after a bunch of beers and dinners out. If you go to an all-inclusive resort, you can put the whole trip on your credit card and rack up a lot of points which will later 3translate to more travel. Free travel, too. Donât take gifts from strangers. If a local gives you a present, you should be really careful. I know that sounds weird, but Spring Breakers tend to accidentally double as drug smugglers. I met this middle-aged Australian lady in Cambodia who took a backpack from a man who she thought was her South African boyfriend, only to find out that he was actually a Nigerian Drug Lord. That backpack had 2k of heroin secretly stuffed into the lining. Obviously, this is an extreme example, but this poor woman wound up in jail because of a gift she took. Use your intuition and be careful. Buy your toiletries ahead of time. In fact, you should get a Convenience Kit. The name honestly says it all - theyâre very convenient. They make travel toiletries a whole lot easier (since everything you need comes in one pre-packaged kit). Its also more affordable to buy 5-6 toiletries in one of their packs, versus individually at Walmart or Target. They make a ton of different ones, all with typical brands from Unilever, Proctor & Gamble and other household names. Individual toiletry sized shampoo costs me $1 or even $1.50 in NYC but if you order a Convenience Kit online you can get 6 of them for $6. Please wear sunscreen! Whether itâs because you donât want to be wrinkled by the time youâre 30 or because you actually care about your precious skin and donât want to look like a lobster, itâs a great idea to lather up in the mornings. Buy it in the States, too, rather than waiting âtil the last minute, because sunscreen tends to be more expensive abroad, especially at resorts near beachy destinations like Mexico or the Dominican Republic. In any case, no matter where you vacation for spring break, have an amazing time with your friends or families and enjoy that well-deserved break from college! I'll just leave you with this James Franco meme . Anytime I travel, be it for 2 weeks or 2 months, there are always a few comforts from home that I miss on my adventures. No matter where in the world you may come from, we can all agree that we each have our own favorite products and stores that we frequent. Weâre loyal to certain brands and carry around extra knick knacks that we cannot seem to live without. 1. 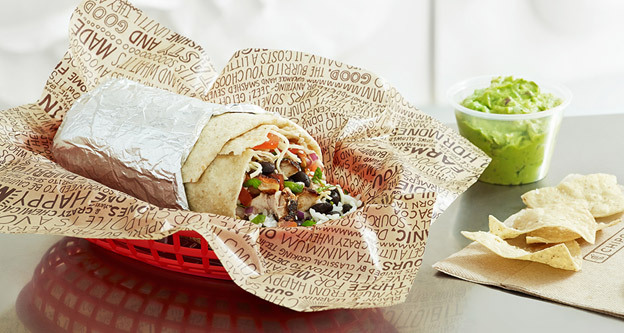 Chipotle - I think it goes without saying that I miss this fast-casual restaurant more than I miss most human beings. Letâs face it, the latin food outside of, well, Latin America is just not that great. Fajitas donât sizzle. Guacamole sometimes comes from a box. Worse, a frozen box. And forget about choosing from pinto beans or black beans, let alone refried. Chipotleâs constant fresh ingredients coupled with affordable prices are something I frequently miss in foreign airport cafes or shopping malls. 2. 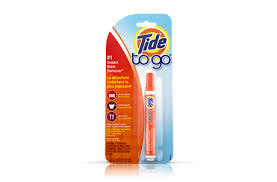 Tide to Go Pens - These are unheard of outside of America and arguably one of our best inventions. Itâs a little portable stain remover from the FMCG giant, made famous from that Super Bowl commercial in 2016. I happened to have a pen with me at a bar in Melbourne, Australia when my friend spilled her espresso martini all over her white dress. It worked miracles, instantaneously erasing the giant stain and preventing us from a night that couldâve gone sour very quickly. 3. PB&J - Sure, I can still make my own peanut butter and jelly sandwiches wherever I find the ingredients. Itâs challenging, though, because most countries have peanut butter that pales in comparison to JIF or Skippy (and if you can find the trusted American brands abroad, chances are theyâre very expensive). Few grocery stores also carry grape jelly. So Iâve had to substitute for strawberry jam or raspberry, which is tasty, but certainly not a classic PB&J. 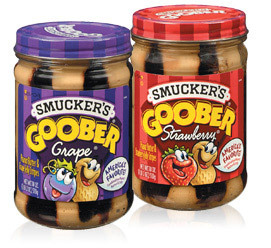 Despite how hard it is to get this All American classic kiddie sandwich, sometimes you might be lucky enough to stumble upon Gerber PB&J in a single jar. I found a jar of it in the Philippines which took me down memory lane. If it werenât for the $9 sticker tag associated with itâs import fees, that is. 4. 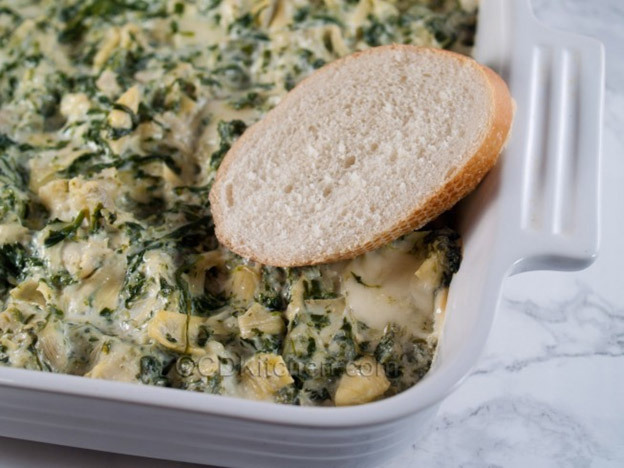 TGIFridayâs Spinach Artichoke Dip - I didnât even realize spinach artichoke dip was American until a friend was visiting me from New Zealand and inquisitively asked what it was on a menu. Thereafter, I found myself craving it abroad and could never find it in any restaurants. While I like all artichoke dips, Iâve always found the one from TGIFridays to be the best. 5. 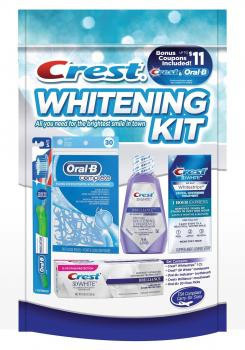 Crest White Strips - Thereâs a reason why everyone says Americans have amazing teeth. For me, itâs Crest White Strips. I use them often back home to keep my pearly whites even whiter. Sometimes I bring a small kit with me to make sure my teeth donât stain from all the delicious coffee and sweets I eat abroad. 6. âNormalâ Sunscreen and Tanning Oil - This may not be explicitly American, but its worth noting here that when you travel to Asia, so many sunscreens and face washes and lotions contain bleach in them. Itâs a cultural difference - we in the West want to look tanner whilst they in the East want to be paler. So if you find yourself in Vietnam or anywhere around the region anytime soon, make sure you stock up on sunscreen before you go. 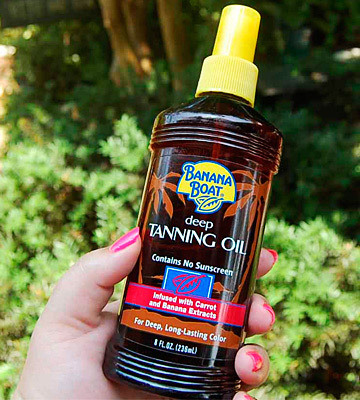 You wonât find brands like Banana Boat too easily (or cheaply) and you will almost definitely NOT find any tanning oil. 7. 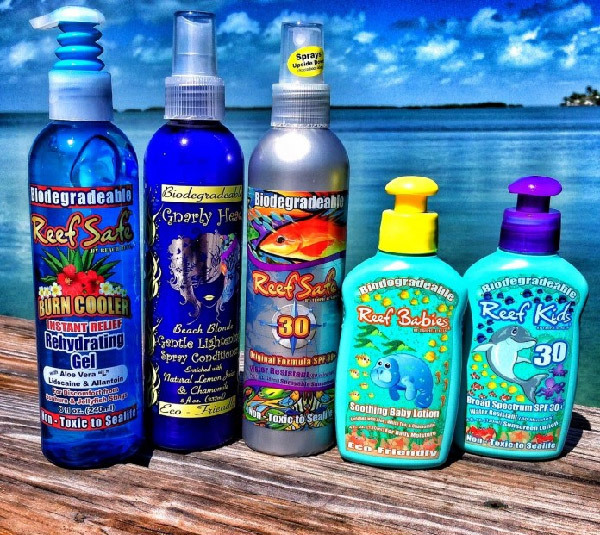 Reef Safe Sunscreen - On the topic of lotions, for those who do a lot of swimming in the ocean (or anyone who cares about eco-friendly products), most sunscreen we use isnât good for our oceans. Especially the aerosol cans. So another product I miss/love, and often have a hard time finding abroad is Reef Safe Sunscreen. Itâll help keep our corals alive and all the animals who live amongst them. 8. 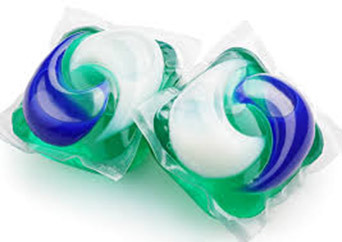 Laundry Pods - another convenience of laundry care back home are the little Tide or Downy pods. You pop one into your laundry and it contains just the right amount of detergent and fabric softener. Theyâre easy to transport too (as long as you put them in a plastic bag to make sure they donât pop all over your suitcase). 9. Makeup from Sephora - I can often find Sephora in other countries (particularly Western countries) but itâs always more expensive! 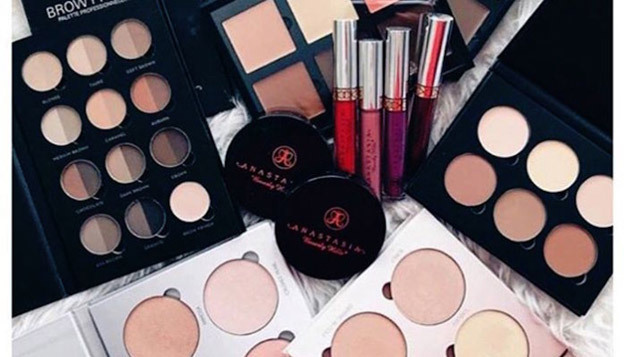 They also donât carry all the same makeup (especially the extensive line of Sephora original products, which are a bit cheaper than but still just as high quality as some of the other brands). Itâs a good idea to stock up on that particular brand of foundation that you love or a mascara because chances are you wonât find it overseas or if you do, itâll cost you double. 10. Travel Sized Shampoo and Conditioner - Other countries are getting better at this, but for some reason, most places Iâve been to either donât have the brands I love or they charge way too much for the <100 ML bottles. In the US, you can usually go to Target or Walmart and get all your travel toiletries for $1 - $2 each . For a consumer, thatâs a steal. Even better though, you can order them in bulk online. Some companies like Convenience Kit have all the best brands and the more you buy, the cheaper they are - sometimes even amounting to less than $0.50 per product! 11. 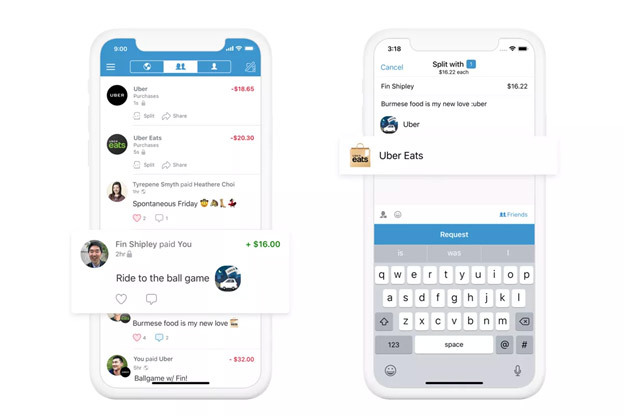 Venmo - While America is a bit behind some European countries when it comes to digitised payment platforms (and Asian/Oceanian), since we donât have the instant tap-to-pay feature on our credit cards yet, one thing weâve had for a while is an instantaneous money transfer app between banks. Itâs so convenient to âVenmoâ other people the exact amount of money you owe them while youâre still out to dinner, and it even works well if youâre taking money out of an ATM overseas with another American friend. (This way, you only use one bank account to take out cash for 2 of you so you donât get hit with double the bank fees). 12. 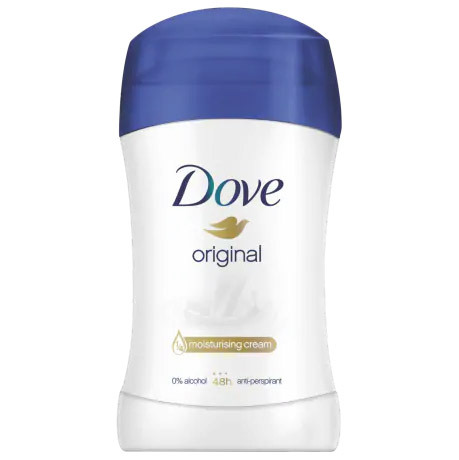 Stick Deodorant - On topic of travel sized products, or just toiletries in general, youâll find that in some countries its nearly impossible to find stick deodorant. Instead, they often use aerosol cans (which are horrible for the environment), or roll-on deodorant (which is similar but feels weird and doesnât stay on as well). Whether youâre traveling for business or for pleasure, thereâs not much worse than missing a flight. Except, of course, missing a connecting flight, which means youâll also be stranded in an unknown city (and perhaps country, or worse, without any of your checked baggage). Most likely, your travel plans are altered due to a circumstance beyond your control, be it erratic weather conditions or worse, plane maintenance. In my case, going from JFK to HKG it happened to be both. I scheduled a direct flight with a 4 hour stopover in LAX, which normally would leave plenty of time to catch my overnight flight to Hong Kong. Except we were 6 hours late leaving New York. This caused me to miss that last flight out of Los Angeles and spend an extra 12+ hours in the airport. I couldâve bought myself a hotel room. But I decided not to, since I was trying to save money! Had I anticipated my delay in travel plans, there are so many things Iâd wish Iâd done differently. In case you ever find yourself in a similar situation, hereâs a few key tips to survive so you can have as comfortable a time as possible. Donât forget your airplane pillow(s)! Lots of people have the circular neck pillows for long haul plane journeys now, and I couldnât imagine flying without one. Theyâre especially great to clip onto the outside of a backpack or a suitcase, allowing you to maximise the space within your bag for clothes and accessories. The real travel experts donât just stop at 1 pillow. They carry 2- the classic neck one and a secondary pillow that you can fold flat. It blows up into a small square and allows you an extra cushion - convenient for camp sites, upgrading the comfort of your window seat and occasionally a life saver for the dreaded moment of sleeping on a floor or chair in the airport. This is a big tip to remember. A lot of people forget about this, especially when they want to bring over 100 ml of their favorite shampoo or conditioner and liquids. I completely understand, but cannot stress enough how important it is to have some backup toiletries with you in your carry on. I didnât and felt so disgusting after just a few hours without being able to brush my teeth or wash my face. Since the LAX airport shut down at night, except for a few night guards and cleaners, there werenât any 24 hour convenience stores I could pop into for a toothbrush or soap. I wish I had one of Convenience Kitâs travel packs with me.I love their kits, especially the ones made for women because they come with all my favorite brands from the US like Garnier and Dove. This one is my favorite and for less than $12, itâs a great value. In NYC these products would cost me ~$3 each so the kit saves at least $10-$15! There are also male kits like this one for the testosterone travelers. And for those of you traveling with kiddies, thereâs kits for them, too. For those of you who are eligible, its $100 a year to register for membership. They mail you an entry card (thereâs also a digital app) that gets you into 1,000s of airport lounges all over the world. Some American credit cards even waive the fee for you. Having a Priority Pass membership seriously enhanced my layover experience that night in LAX. As soon as the lounges opened up at 7 am I went in for free breakfast, a coffee and a nice hot shower. As a general rule of thumb, I usually carry a small sweater or jacket to put on in case the aircon is blasting on the plane or in the airport. But since the 3 different airlines I flew all didnât want to claim responsibility for my baggage, all my clothing got lost in transit. Iâm still not sure how, considering I only went from NYC to LA to Hong Kong, but its good to be prepared for when these things happen. I didnât get my bags until 2 days later in HK. This rarely happens, but it wouldâve been nice to be prepared with at least a clean pair of underwear or two. Iâd pack a few extra necessities in your carry on - socks, sunnies, and your seasonal needs like a swimsuit or a hat and gloves. This should hopefully help hold you over for a day or two if your luggage were ever lost. It also helps to wear a neutral outfit when you travel. I was lucky that I had a black dress on (and even luckier I had a little sister in Hong Kong who shared some of her clothing with me). The dress was an easy cotton piece that dries quickly and it didnât look too obvious when I wore it a 2nd day in a row. Hopefully these tips are a helpful reminder for your next adventure- although letâs hope you wonât get stranded in the first place! Itâs the most wonderful time of the year… well, except you forgot your toothbrush in the morning rush for the airport again, or your wash bag is in your checked luggage, and well, accidents happen. Family reunions, old friend reunions, events and outings just wonât feel how they should this holiday if you have to look for odds and ends on your vacation. You want to create time for whatâs important, like catching up with everyone and making unforgettable memories; not spending more money and time looking for essential items at your destination. Even after spending up to $40 on tiny toiletries, you might only get hygiene items you donât trust. Itâs best to have a carry-on you can keep your personal care items in. On the other hand, packing a carry-on for a vacation can seem herculean. How do you pack everything you need while staying TSA-compliant? The TSAâs 3-1-1 rule makes it easy to remember: liquids, gels, aerosols, creams, and pastes must be 3.4 ounces (100ml) or less per container, and they must be in a quart-sized zip-top bag. To make this as easy as possible for you, Convenience Kits has personal care travel kits that include personal care items 3 ounces and below, in quart-sized zip top bags that are durable, reusable and water-resistant. The Woman on the Go Fructis Premium Travel Kit is 100% perfect for women. It contains preferred brand items such as the Fructis Shampoo and Conditioner, Degree Deodorant, Facial wipes, Disposable Twin Blade Razor, a two-way folding mirror, to name a few. This whole package is presented in a stylish and reusable quilted black bag. The men are not left behind, as the Man on the Go 10 pc Kit contains everything a guy needs for a quick trip or a long weekend. From shaving cream, Gillette Razor, toothpaste and toothbrush to comb, shampoo and conditioner, this kit truly offers convenience. Both kits mentioned are great for gifting as well, and you get a sweet discount on as little as 2 kits. But what if you donât like the products in the prepacked kits? Want to throw in your favorite shampoo or conditioner? Or you just need other hygiene items? This is where Convenience Kits is unique. Apart from the prepared kits, Convenience Kits has a curated list of products so that you can create your own kit from the scratch. With stock from Colgate, Crest, Tresseme, Pantene, Gillette, Eucerin, Barbasol, Pure Silk, Olay, Oldspice, Freshscent, Edge, Dove, and other top brands; itâs obvious that Convenience Kits is concerned about your comfort. To customize your travel kit, you start by picking any of the durable, reusable, TSA-compliant bags. You can even opt to print a custom logo or message on it. After then, you can fill the bag with a wide range of items from the categories. I know that catching any sort of sickness on the flight will ruin the entire holiday, so I wipe down anything I will be touching on the plane with this 99.9% effective Hand Sanitizer. Want to know what the dirtiest thing in a hotel room is? The TV remote. If youâre staying at a hotel, you absolutely need to wipe down anything you or your kids might touch. You could use the antibacterial wet wipes or the sanitizer. It might interest you to know that Convenience Kits stocks a Pantene 2-in-1 shampoo and conditioner, and Freshscent Shampoo and Body Bath; so that you can fit other products into your bag. To further free space in your zip top bag, thereâs a nice foldable travel toothbrush. Of course, you may choose to go with regular-sized soft bristle toothbrushes like Colgateâs, which are also available on the website. Dentek comfort floss picks are here for you if youâre flossy, and you have a couple of name brand toothpastes to choose from. There are even items you can use in-flight, like the facial wipes, brush and comb. Nobody wants to wash up with airplane water, so you can add some cleansing facial wipes to your kit to give your face that boost when stepping off the plane. Thereâs a foldable 2-in-1 brush and mirror that is perfect for when you are trying to make yourself look presentable without leaving your seat. You can brush your hair into place with the brush, look in the mirror mid-brush till satisfied, and apply makeup, all in your seat! Guys can add the unbreakable pocket comb to their custom kit. At the end of the day, these kits are so convenient that you will buy a few extra to throw into your bag for use on the go, or to gift your friends. Thatâs all well, as you get to enjoy great discounts on as little as 2 kits. This fall/winter season as you look around you at the many things to be grateful for, who can wish to NOT extend that gratitude out to others? There are so many who are less fortunate than ourselves. The gratitude we feel tugs on our heart strings, asking us if thereâs some small thing we can do for others. This has become a universal feeling that can help your fundraising efforts to spread good cheer. The truth is that everyone needs good hygiene and everyone can use a travel kit, no matter who they are. It could be your friends or family. That travel kit may come in handy this holiday season. The need could be met at the homeless shelter downtown where hygiene kits â and even teeth whitening kits â are amongst the most well-received gift. Itâs almost impossible for hygiene to stay at a high level when someone is on the move, not knowing where their next bed will be for the night. But having a toothbrush, dental floss and toothpaste could in fact save someone from heart disease by removing bacteria from the teeth that head straight for the heart and blood vessels, scientists report. Another reason why the homeless are thrilled with a hygiene kit is that they often worry about their appearance on the day of a long-awaited job interview. Yet, inside the kit you provided was Tresemme shampoo and conditioner with its great aroma, hair spray, deodorant and of course toothpaste, toothbrush, floss and a disposable razor. Itâs all the essentials for making that good impression before a potential employer, who can open doors to the person and help get them off the street. You could also choose to change the ingredients of the kit to the Womenâs Deluxe 10-piece Herbal Essences Travel Kit (Herbal Essences Shampoo & Conditioner, Eucerin lotion, Secret A/P Deodorant, Crest toothpaste, toothbrush, Dentek flossers, styling comb, and quart size zip top bag that becomes a cosmetic travel bag ($42/4 kits). 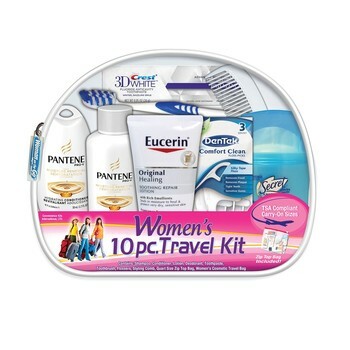 And if you prefer Pantene shampoo and conditioner instead of Herbal Essences or Tresemme, then thereâs another hygiene kit thatâs available to choose from â the Womenâs 10piece Travel Kit ($43.50/6 kits). Or even swapping out the shampoo and conditioner for the Fructis brand and adding some shaving cream, a cotton swab vanity pack, nail file, shower comb and two-way folding mirror for $53.70/8 kits is another option. If you have a heart for women during that âtime of the monthâ, providing a Womenâs Deluxe Feminine Hygiene Emergency Kit for them that contains 2 tampons, 2 maxi pads, 2 Advil caplets, and 2-feminine hygiene moist wipes in a vinyl pink zippered bag with a handle strap ($40.80/12 kits) will rescue a dozen women during those rough times. As you can see, these are noble goals â and ones you probably end up receiving a reward for in the afterlife. And thatâs why these hygiene kits and travel kits are excellent for your church group to use for a fundraiser. Itâs not a hard sell when you stand before the church congregation and explain these simple facts that were previously stated. For an investment of $33.30 for the Womanâs Premium Travel Kit â the cost of a weekâs worth of Starbuckâs high caffeine high sugar drinks â in order to help directly improve the lives of three women is truly a no-brainer for the average churchgoer. There are travel kits suitable for moms â A 10-piece Johnson & Johnson Baby Travel Bag (baby powder, shampoo, lotion, rubber duck, brush, comb, rattle and bath guide booklet - $46.50/6 kits) or those about ready to enter the hospital such as women undergoing cancer treatment, ready to give birth, or going in for a repeat procedure. 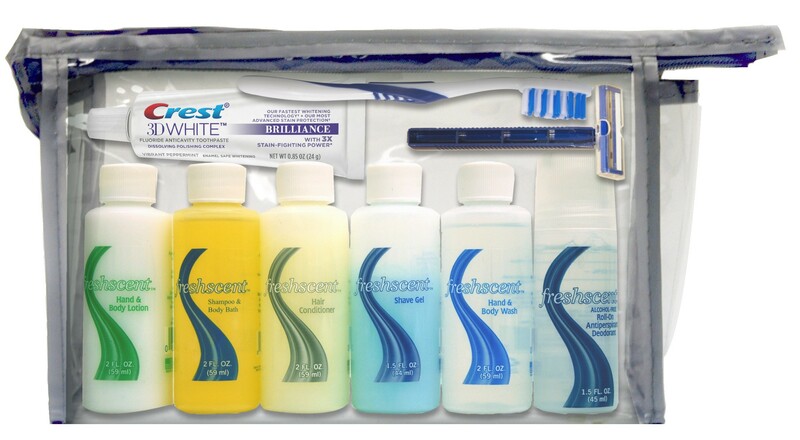 The Hospital Admission Kit is a unisex kit with Fresh Scent shampoo, body wash, lotion, bath gel, liquid soap, shave gel and alcohol-free roll-on deodorant, hand sanitizer, Crest toothpaste, toothbrush and razor, ($200/50 kits). Or you might have a business group that sees the demise of the American male in society and is faced with high unemployment rates. They can be reached via different organizations that directly train men for new jobs â and a Man on the Go 10 piece Premium Travel kit is that extra little boost they need in confidence for that new job interview and first week of worth. Receiving such a gift that occurs essentially out of the blue is like a supernatural hand of God coming out of the heavens and helping them. Yes, itâs true that the men in this category may not be traveling on a plane but itâs still suited for them because it plants a seed that he WILL be traveling soon. And itâs only $7 per kit starting price, which decreases the more kits you purchase. This type of kit is well suited for travelers because it meets all specs for carrying all items onboard. The TSA trashcans at the airport wonât contain any items from this travel kit. The travel kits and hygiene kits are absolutely perfect for gifts for those who are both in your inner circle as an extra gift. But theyâre also great for those in your outer circle of friends that deserve an individualized gift for the holiday such as colleagues at work, members of the choral group you belong to, the neighbors you love, and the people who are in service jobs that service you (UPS man, mailman, dentist, doctor, cashier at the bank, etc.). Even businesses getting ready to put on an annual holiday party would welcome travel and hygiene kits to distribute to their employees in addition to the annual turkey or ham. Everyone can benefit from a travel kit and itâs usefulness will never expire. It really can be a struggle sometimes—preparing to travel—especially if you have to travel often, whether alone or with a group. Thereâs a fear that is common to us all when preparing to travel, the fear of leaving something behind, but in this case itâs forgetting to take that special personal care product on the trip—that shampoo, shaving cream or perfume. We all have that one product that we feel incomplete traveling without. Apart from being attached to the product, they might be difficult to get at your destination; and we have all learnt not to trust the hotel conditioner. Luckily, Convenience Kits International is here to help out in a peculiar way. We offer a very simple and essential service, providing a personalized package of hygiene products. The idea of getting all your favorite personal care products in a nice package takes significant time out of what you need for your travel preparations. You donât even have to worry about the additional weight, because the whole package meets TSA requirements for carry-on items. Convenience Kits helps you to build your unique hygiene package from the scratch. You first get to pick a TSA-compliant bag, ranging from simple to fancy. You then choose the contents from a thoughtfully organized collection of personal care items, from shampoos and conditioners to oral hygiene items, shaving items, deodorants and accessories. The items being offered are all from twelve top-selling national brands, so most people donât have to worry about a product being new or unsuited to them. Just make sure everything you pick can fit into a quart-sized bag. Happy shopping! Apart from buying them yourself, it would be great to have a one-stop shop to cover all your travel needs, from ticketing and hotel-booking to hygiene products. If on being directed to the Convenience Kits website you feel that hand sanitizer is essential from plane to hotel, so you donât catch any infections that will ruin your trip, you can just add them to your product bag with other items and checkout. If you feel that the 2-in-1 conditioner and shampoo from Pantene is best for you, you can do the same. All that would be left for you is to pack your bags and enjoy the trip, any agency that starts providing this much convenience is sure to experience a hike in sales. In the event that you donât find a travel agency that can cover all your travel needs, local stores in your destination are the next best thing. Make sure you choose a package design branded with a positive message (many have found this subconsciously helpful). You can simply order ahead and get them sent to your hotel so that you see them as soon as you check-in; this would save you some stress and extra luggage weight—we all know how much difference it can make to have less items being searched when travelling. You can get some extras for next time or to gift your frequent-traveler friends. I would definitely rate a store highly if they stocked the exact personal hygiene items I need. Our corporate clients have also found use for personal care packages when catering for their employees during company retreats or seminars. A bag of personal hygiene items on a trip goes a long way in making anyone comfortable. What better way to appreciate your employees than with a branded package containing personal care items, courtesy of the company? It significantly reduces the stress of planning trips, for both company and employees. The option of printing the companyâs logo and details on the package makes it even better. Just make sure you get clear bags, so that your employees can get through security screening easier. Stepping it up a notch, employees can be asked to go on the website and pick the items they want to include in the personal care package themselves. A female employee may want a foldable brush and mirror and facial wipes that enable her to get ready fast. We have even had orders from people planning weddings and other events, and they were very satisfied with the personalized hygiene products, especially those who had to travel for the event. They even concluded that Convenience Kits has something for everyone, talk about true convenience! While on the plane, they were able to keep their children busy with the TIC-TAC-TOE Peg Game, Wooden Baseball Peg Game and Colored Blocks in the childrenâs kit. Vacations are wonderful! Packing for vacation? Decidedly less so. It takes time and it takes some concentration. Choosing what to bring, trying to prepare for all contingencies, and getting it all to fit into the ever shrinking luggage size requirements of modern air travel is no easy feat. A business trip may come up last-minute, leaving little time to arrange a great traveling bag. When you travel, whether for work or vacation, packing is always something you want to take a little extra time double checking. Why does it seem like there is at least one vital thing you forget to pack each time. What a shame that it is almost always remembered right when you have reached a point of no turning back. The image is clear in your mind—you can see the item exactly where you placed it in your bedroom, right on your nightstand. This list contains important items that can easily be forgotten. It can help you prepare for your journey and prevent you from being forced to overpay when buying something on the road, or winding up with needless duplicates when you return home. No matter where youâre headed, the potential for dry lips is almost guaranteed. Ranging from mild discomfort to downright painful, chapped lips are easy to avoid, if youâve remembered to pack some lip balm. But since lip balm is small, it is both easy to lose and easily used up, so consider packing more than one. There is a reason there are phone chargers in every gas station and convenience mart. Many of us couldnât make it through an hour, much less a day, without our phones. This item would need to be replaced almost immediately if forgotten. Everyone has their favorite brand of shampoo, and thatâs why if you forget yours the process of finding and buying it on the fly can be a bit of an ordeal. And finding your brand in a TSA compliant size at a momentâs notice? Even more so. Luckily, there are companies that specialize in creating well stocked travel kits, ensuring you have everything you need. The leader in this field is Convenience Kits International, which has been making packing hassle-free since 1985. They have a multitude of kits to choose from, filled with the most popular nationally recognized shampoo brands, such as Garnier Fructis, Tresemme, and Herbal Essences. And did we mention the ridiculously cute bag designs? Although sometimes overlooked, sunscreen is one of the easiest and least expensive health protecting products available. As added benefits, it keeps your skin moisturized and provides a light, pleasing fragrance (of course, if you have sensitive skin or simply prefer unscented products, thatâs also available). Be sure to add some to your kit of travel essentials. Vacations can often include a day of adventurous activities that leave your hair tangled and wild, followed by that nightâs elegant dinner. You never want to return to your room only to find you have no way to keep your hair manageable. This goes double for business trips. Have you ever noticed that growing out an unflattering haircut can seemingly take forever, but razor stubble takes about 15 minutes to show up? The longer your trip, the more likely youâll need to shave. Pack a good razor. It goes without saying that if youâve forgotten your toothpaste you have also, most likely, forgotten your toothbrush. And even if you remembered to bring a tube of toothpaste, it is entirely possible to run out because of the size TSA demands on flights. This is another time a travel kit can come in handy. With Convenience Kits International you can create a custom combination with whichever specific products you need for your expedition. Custom kits start at a ten piece set that leave the amount of items and brand choices up to you. Get more of the products you use the most! Bags can even be customized by adding a logo or monogram. This gives the perfect business professional touch or commemorates special occasions like a weekend away with your bridesmaids. In a hotel, of course, a mirror is a given. But if someone else is in the bathroom and youâve only got a little time to get ready, a compact mirror may be just what you need. And in situations like camping, a mirror is going to be much harder to come by. This may be one of the most important items you could forget to pack. If you like to pack the night before to make sure youâre all set, something like this that is left out for morning use is easy to overlook. Many of these items are left almost on purpose because of the hassle of making your own or finding travel sized, TSA compliant toiletries. When you fly and have to follow specific guidelines, it may cause even more unneeded stress. Even if you purchase toiletries at your destination, if you are flying again they need to be selected carefully and thereâs a good chance you will just end up tossing them. Using reusable containers is not only environmentally green, but also easy on your wallet. Just refill these containers from the products you already have in your bathroom. When purchasing a full kit, it will be a lot easier to bring one bag than gathering all of your items. Kits include basics items like shampoo and conditioner, shaving cream, toothpaste, toothbrush, disposable razor and comb. This takes most of the thinking out of packing necessities. And for those who are not known as the most organized packers, something simple with all the essentials in one place is perfect. Convenience Kits International specializes in a bag for men. Each kit offers high quality items inside and name brands including Crest, Gillette, and Axe products. They are toiletries! It is very common to bypass this entire category of packing and be left forced to purchase alternatives. This takes up valuable vacation time and can become pricey due to airport and hotel stores taking advantage of your forgetfulness. Whether you package your own supplies or decide to take the hassle-free route and purchase a travel bag, one thing is for sure, you wonât be leaving necessary items at home again! Ideally a joy but often a chore, travel is an essential part of modern life. We travel for business, for family get togethers, for summer holidays and for so much more. But traveling can involve long hours of being in transit in a vehicle or airplane which can make it strenuous and boring. Thankfully, Convenience Kits International makes traveling easier and more enjoyable with their wide range of travel kits designed to meet all of your travel needs. All you need to do is to choose from their thoughtfully organized collection of personal care items, shampoos and conditioners, oral hygiene and shaving items, deodorants and accessories and select your perfect travel kit to your custom specifications. And when you run low, CKI makes it simple to replenish your supplies as you need them. 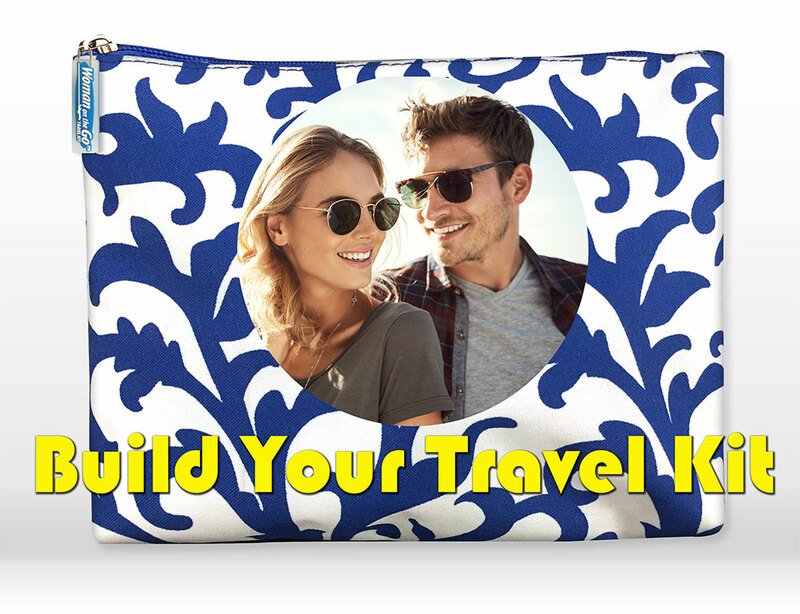 On the other hand, Convenience Kits International knows that one size does not necessarily fit all, and you may prefer to create your own custom kit, so they also create a provision for you to build your kit using TSA Compliant travel sizes. Letâs take a look at Convenience Kits Internationalâs existing TSA compliant kits. Women love quality products that convey elegance, and this is the type of kit for specifically made for them. The kit contains practical, quality personal care travel products packaged in a stylish clutch bag. These compliant kits make an excellent gift for any woman. It contains some unique product every woman needs - items like Plackers Dental Flossers, Crest 3D Toothpaste, Toothbrush cover, Tresemme Shampoo and Conditioner, Secret Antiperspirant Deodorant, and a BIC Soleil Disposable Razor all in premium clutch bag. Rest assured that you will be getting full value for your money purchasing this kit. Available in a fun pink color, this is a kit especially loved by girls. Keep your younger travel mates from interrupting your peace during the journey due to boredom. Travel Kidz kit for Girls is sure to have them engaged throughout the trip with the included TIC-TAC-TOE peg game, Stickers, Colored Blocks, as well as essential toiletry items such as Hand Sanitizer, and Dr. Fresh Childrenâs Toothbrush that also come with the kit. Designed for an age range of 3 to 10 years, it is exceptionally trip friendly and fun for your kids. Packed in a handy mesh bag, the AXE Extreme Mini Premium Kit is a convenient grab-and-go bag full of AXE products, dental care, and other hygiene supplies that can be used before and after the gym, on a plane, or anytime your busy lifestyle necessitates some portable personal hygiene. This premium kit contains AXE Deodorant Spray, AXE Body wash, Crest Toothpaste, Toothbrush, Comb, and 2 Dude Wipes in black mesh travel bag. 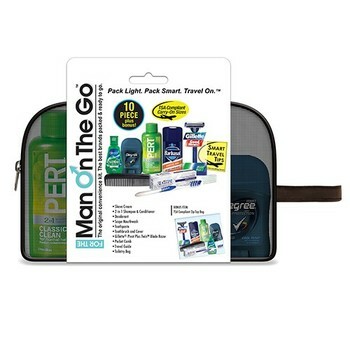 Man on the Go Premium Travel Kit is for guys who intend to go on a quick trip or long weekend and value absolute convenience. It contains 10 TSA compliant sized products offered in a stylish black mesh bag and includes Barbasol Shave Cream, Comb, Toothbrush, Crest Toothpaste, Scope Mouthwash, Gillette Good News Razor, Travel Guide, Degree for Men Antiperspirant Deodorant, Pert Plus 2in1 Shampoo+ Conditioner, and a TSA Compliant Quart Size Zip Top Bag. This is a kit youâll grab time and again for all of travels. Simple, easy, and one less thing to have to think about! Specifically made for lovers of great accessories, the Womenâs Deluxe Travel Kit is filled with TSA compliant sized womenâs national brand toiletries. These perfectly pre-packaged kits are gym locker friendly and are ideal for a weekend getaway or anytime you need to freshen up away from home. Included are Pantene Shampoo, Eucerin Lotion., Secret Antiperspirant Deodorant, Crest Toothpaste, a Toothbrush, Dentek Flossers, Styling Comb, and a Quart Size Zip Top bag in a reusable zippered cosmetic travel bag. This pre-filled, carefully organized, easy to pack deluxe kit will keep you looking your best, wherever your travels take you. All of Convenience Kits Internationalâs pre-packed travel kits include six to twelve top-selling national brand personal items so you donât need to worry about basic necessities while on the road. All your travel hygiene needs come in a convenient and durable travel bag, and everything included is TSA Compliant trial-size to make your travel experience as smooth and easy as possible. Getting away for vacation trips with family can be hectic, especially when packing for your little kids. Make it easier with Convenience Kits International. And if you find that your mileage does indeed vary, just remember you can always choose to build a perfect custom kit right on our site! Every school year brings with it a myriad of unknowns and opportunities. Perhaps today will be the day he finally makes the varsity team. Then again, perhaps this is the day he gets detention for starting a food fight in the cafeteria. Each day can be as unpredictable as the next and you never really know what you are going to get. So if you are looking be prepared for everything between gym class and a spontaneous food fight then you might want to check out Convenience Kits International. For the busy parent with the kid whose known to get a little messy from time to time, these one stop pre-packed kits will have everything your kid needs to make it through the day fresh, clean and ready for any emergency. Perhaps the greatest thing about purchasing a pre-packaged hygiene kit is that it has everything you need for just about every scenario. Letâs just take this Womenâs Deluxe 10 piece Pantene Travel Kit. Yes, this kit is packaged perfectly in TSA compliant sizes that make it perfect for ease of travel. However, those same features make them ideal to fit into school lockers and backpacks. So whether it to clean up after cheerleading practice or just to have it handy for a hygiene emergency at school, this kit delivers what you need. However, having a kit accessible to your kid at school is not only for the emergencies that you can imagine. In fact, it might be best served to be there for all the emergencies you canât even imagine. School can be a trying time for youth and simple routine hygiene issues can lead to teasing and other inappropriate reactions. Having a travel sized toothbrush or even a small offering deodorant can go a long way to helping youth navigate this challenging season of life. Lest the young men think they are off the hook here, I think we might as well go ahead and admit that there are few things more stinky than a growing teenage boy! 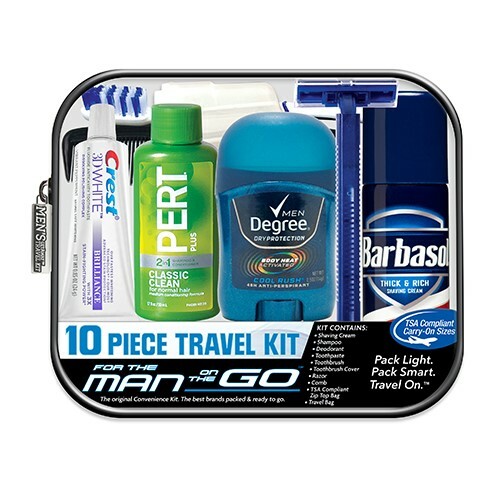 Now, we do make kits for full grown men like this Menâs 10 piece Deluxe Hygiene Kit. However, they do come with a razor for shaving and most schools might certainly frown upon this in a bookbag. Thankfully, we offer a variety of menâs kits and even offer the ability to customize your own kit from start to finish. However, for your average teenage boy and all his stinky needs Iâm pretty sure this AXE Extreme Mini Premium Kit will get them through the day. Or perhaps you would rather keep it simple and grab a universal Unisex Hygiene Kit that will take the stink out of anyone anytime. This really is top notch convenience for both you and your kid as you get ready to head back to school. You pack the lunch. You pack the books. You might even pack the Trapper Keeper if those are still a thing these days. Donât forget to pack the travel hygiene kit and your kid will be ready to tackle whatever the school year brings. Cafeteria food fight and all! Finally, you might be pleased to know that Convenience Kits International is doing more than keeping your kid fresh and clean this school year. The truth is that these kits have been keeping youth and families in some of the most impoverished and disaster stricken regions healthy. These kits, both due to their practicality and affordability, have been deployed to disaster regions throughout the world. They have been used in homeless outreach so that those struggling to get by can maintain dignity and self-respect. If you serve or live in an underserved or impoverished school district this year, donât overlook the compassion involved with sending a few of these kits home with each student. Purchasing these kits for students in these areas can serve as a blessing in more ways than one this school year. It might strike at a kids self worth to be personally handed a hygiene kit, but when the entire class gets one the kid that needs it most can quietly celebrate. Consider an act of service this year as you head back to school and gift the gift of hygiene and self-worth to those who need it most. The 4th of July is the holiday when Americans celebrate the birth of the experiment we call America. Sure the British might just label it âunruly colonies dayâ but Americans take pride in their steely resolve and fierce independence. To celebrate, theyâll be taking to the road this week for destinations of revelry from sea to shining sea. Whether it's a trip to D.C. to take in the monuments of the nationâs capital or a camping trip to take in the great American outdoors, travel and the 4th go hand-in-hand. So if youâre planning a 4th of July road trip youâll want to be sure you donât leave the house without all of your essential basics - including the one hygiene product you always seem to forget. With a comprehensive pre-packed travel kit, youâll never have to worry about forgetting any essential item again. The bears might not care if you forget your deodorant, but the family you have to share a tent with will thank you for grabbing your kit before you go. The great thing about a travel kit from Convenience Kits International is that they have a solution for every member of the family. So whether you are just grabbing a kit for yourself or you are the organizer-in-chief looking out for the whole family, it's an easy process. The menâs travel kits have everything a man needs to survive any 4th of July experience you can throw at them. If you'll be staying in a hotel and plan to keep up the freshly shaven look, there are kits with disposable razors and shaving cream. On the other hand, if you plan to rough it in the woods and want the grizzly look to go with it, there are mini kits available with just the basics. 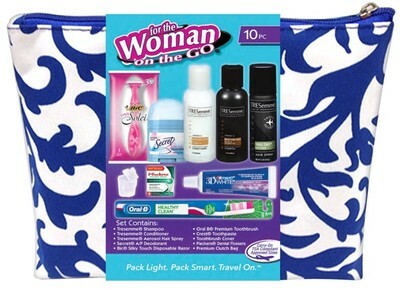 For the lady of the household there exists a full array of travel kits for women. Nothing is more frustrating than having to run to the store to find one of the million little travel bottles you need, or trying to squeeze out enough from your big bottles to last the trip. So donât. Grab any of the various kits that will still have you smelling wonderful without the worry of leaving something behind. You can find some of the same luxury products and travel accessories you use everyday. Even better, both the men and womenâs kits are TSA compliant from the start, so youâll never have to leave your necessities at the gate with the good people of the TSA. Finally, for the busy mom trying to check off everything on the packing list, there is a solution to make your life easier. Kids and baby travel bags are what have been missing in your busy life. These kits come with everything your children need to stay fresh and clean, along with some toys to keep them entertained on the flight or road trip. There is even a baby bath bag that brings Johnson & Johnsonâs best products on the trip with you. And, if one of the premade kits doesnât have exactly what you need, you can customize your own kit. Pick all the products you want and add as many of them as youâd like to survive your 4th of July travel experience. There really is no reason to go through the same old hassles anymore. These kits are priced so well that you can even toss the whole thing when this trip is over, and pick up a new one for the next holiday. Itâs time to celebrate and enjoy a little life, liberty and pursuit of American happiness with a no-hassle TSA compliant travel kit. The world is an amazing place and some of its greatest beauties are often a ways off the beaten path. From camping, hiking, fishing, hunting and beyond, hitting the great outdoors has become a global passion that has only grown in popularity since city dwelling life has increased. While the benefits of ditching rush hour traffic for clean air and blue skies are pretty universal, the truth is that not everyone embraces the rustic nature of outdoor life. Many dislike the void of modern conveniences and, for others, the wildlife - from bugs to bears - is a bit too much. However, with a little prepping, a trip outdoors doesnât have to be a return the Stone Age. One can enjoy the beauty of the great outdoors while keeping up their personal hygiene as if they were staying at the Ritz Carlton hotel. Whether you are camping or hiking, space becomes an issue, as you can often only take what you can fit in your car or carry on your back. This causes many would-be outdoor adventurers to forego numerous modern amenities related to their normal hygiene practices. But what if that werenât necessary? What if there were a convenient kit already packed with everything you need, ready to go with a click of a button? These travel hygiene kits are often associated with plane travel, as all items come in TSA compliant sizes and packaging. Getting through the airport has never been more complicated, and you canât blame the consumer for wanting every edge they can get to make it an easy and peaceful process. Conveniently, the very same attributes that make these kits TSA compliant also make them an excellent choice for camping or hiking. Their small and lightweight design makes them easy to pack in your standard backpack or rucksack. Moreover, the packaging and bag that serves to keep these items together likewise ensures items like your toothbrush donât make an inadvertent rendezvous with the dirt and grit of the great outdoors. With these kits, you donât have to worry about losing or ruining the hygiene items that you use every day back home. Additionally, they are so affordable you might not even bother to bring them back with you after your trip is over. Just please, pretty please, donât litter and leave them out in the great outdoors to mess up the scenery. Another advantage of picking up a kit prior to hitting the outdoors is that you can completely customize it to suit your trip. If you are a man planning to grow out your grizzly beard to match the wildlife, simply pick a kit without a razor or shaving cream, like this AXE Extreme Mini Premium Kit. It even comes with âDude Wipesâ which means you can skip the shave but still avoid the stink after a 10-mile hike. Even better, you can actually customize your kit to hold exactly what you need and nothing more. Whether you want one of each essential item or perhaps just 10 toothbrushes, you simply click and assemble what you believe you will need for the length of your trip and it comes packaged right to your door. Kits are available for not only men and women, but also there are packages designed to clean and entertain the little ones on the trip as well. It is a common sense way to travel with convenience and class whether you are taking to the skies in a commercial aircraft or hitting the stunning views of Glacier National Park. Finally, Convenience Kits International has proved the versatility of these kits in rugged environments as they are frequently given out to individuals and families during disaster recovery or for homelessness relief. The ability to care for oneself during a difficult time is hold on to a vestige of dignity when it matters most. For the outdoor adventurer who simply doesnât love the dirt and grit of the great outdoors it can simply be the opportunity to make a wonderful experience a little more civil. Hitting the great outdoors with convenience and class has never been easier. It is perhaps a misnomer to call this product luxury given that most only cost a few bucks. Then again, the problem this product solves has such unparalleled convenience it sounds like something one might expect to cater to those who can easily buy a solution to any problem. Convenience Kits International has made travel, hygiene and social outreach easier than ever before. While the products themselves solve an immediate problem for any traveler, it is the social impact that makes this organization truly unique. The same type of products they might sell to the well-off business person flying in first class are also available in many forms for the homeless, downtrodden and needy. Luxury convenience and social impact have met at a unique juncture and I think youâll see why below. For the savvy traveler, the days of measuring out shampoo and other personal care necessities into TSA approved size containers are over. Moreover, so are the day of forgetting a hygiene essential on a trip and having to pay $5 bucks for a mini sized deodorant at the hotel gift shop. Convenience Kits International has made that an entire process as simple as click and ship. They sell travel and hygiene kits packed with the leading products in the industry at amazing prices. In fact, they are even priced to a point that you can disregard packing them back up and bringing them back home if you are so inclined. Next time you are ready to travel, just order another kit. Whatâs more exciting is that these kits can be completely tailored to your individual needs, whether you are packing for a male, female or even kids. You donât need to frantically shop the travel isle at the grocery store the night before the flight. If you are a man/ Woman on the go, simply choose from one of the many Man on the Go travel options. If the baby is coming with you then this Johnson and Johnson Baby Travel Bag has got you covered. If you have ever travelled then you get the point.You understand just how this little kit makes your life remarkably easier. All kits are TSA compliant and you can even personally customize what products are added. Itâs a no brainer that sees a high number of repeat customers. Once you try it, youâll never go back to the old way of travel. Thatâs luxury convenience for common sense prices. But letâs talk about that social impact. For as little as a buck or two a kit, Convenience Kit International is bringing this unparalleled convenience to those in need and non-profits are loving it. Whether it is a homeless veteran or perhaps a family on the verge of living on the streets, self-care quickly becomes a struggle for those in need. This is more than just giving someone the ability to brush their teeth or wash their hair, this is about empowering those who struggle to understand that they have value. The body is the armature of the self and when people are able to retain their dignity and self-worth during a difficult season of life it matters. The use of these products have been embraced by major organizations providing assistance to the homeless, disaster relief and a variety of other social causes. However, they have also been used by the ordinary caring person with a heart to be a Good Samaritan. Rather than hand out a dollar or two to those asking for help, they are able to empower the person in need with a hygiene kit that is small, compact and easy to take with them wherever they go. To both the well-off business traveler and the person seeking housing, this is most certainly a luxur convenience. Convenience Kit International has committed to not only transforming the process of travel, but the very world around them. To say that travelling can be a stressful experience would be an understatement. To say that travelling through a modern airport is like swimming in the ocean, or better yet, the Dead Sea, after repeatedly nicking yourself shaving would be putting it lightly. Letâs face it, anything and everything that makes this experience a little easier is worth its weight in gold. Throw in a couple of screaming kids and an overly touchy feely TSA agent and you might literally pay gold for anything that can bring relief. Thankfully, a kingâs ransom is unnecessary. For just a few bucks you can pick up the most common sense item that every traveller needs. In fact, it makes so much sense it might actually be genius. The hygiene travel kit is the most obvious thing youâve never thought of before, but once you do youâll never go back. The process of packing for a trip is fraught with the âdid I forget somethingâ stress we all know too well. It could be a cell phone charger, passport or even favorite book. Most travel destinations bank on the fact that you will indeed forget something. Thatâs why the gift shop or convenience store in the hotel or resort lobby sells mini travel-sized deodorant for $5 bucks a pop. But for the savvy traveller, it doesnât have to be that way. Instead of adding toothbrush, toothpaste, deodorant, shampoo, etc., to your packing list, just add travel kit. Hereâs a perfect example, with everything you need in a TSA compliant clear travel bag. Anyone who can afford a plane ticket can afford a few bucks to simplify their travel experience. These kits are so popular with frequent travelers, they are even sold by the case. Whether you travel for work or pleasure, if are on a first name basis with the local TSA staff at the airport (or feel as if you could be), youâll love being able to just grab a fresh kit when youâre ready to travel. And since these kits are so inexpensive, you donât even have to pack it back up when youâre heading home if you donât want to. Another great thing about these convenience kits is that you can even customize them if you wish. You donât have to take whatever standard issue hygiene products come in a particular kit. You can choose between a variety of products and have the bag already packed exactly to your liking. If you are up for a little fun, you can go buildyour own custom kit now. Of course, if quicker and easier is more your speed, you can also grab a pre-assembled menâs or womenâs kit, packed with premium products. Lastly, we feel it is important to note when companies pursue capitalism with a cause. When organizations are able to innovate for the social good, amazing things can happen. Convenience Kits International has made the hygiene acquisition process amazingly easy for non-profits or organizations with a tight budget. These Not for Profit/Budget Travel Kits simplify the process of disaster relief or human social outreach. Whether you are a large organization seeking to make an impact on a massive scale or just a kind hearted person who likes to keep these kits in your trunk, you have the ability to transform a life by bringing it a little joy. Each of us deserves to know a little joy in each day and, for less than the cost of a typical add-on or impulse purchase, you just might be able to be the deliverer of that joy. Who knew? For a few bucks you can have the most simple solution to travel woes and make a social impact at the same time. As is often the case, this uncommon bit of common sense is so brilliant it just might be genius. Travel will never be the same when you jump on board with a convenience travel kit. Are you planning a solo trip to help you experience the wonder of the world, while also discovering a more authentic version of you? Then youâve got a lot to think about and even more to be excited about! But, itâs important to consider the practical aspects, as well as the spirit of solo travel. Thatâs why weâve put together this guide to help you get in the right mindset for an amazing trip that will also save you a few hassles along the way. Away from home doesnât have to mean away from basic necessities, and hygiene is always a must! When youâre traveling solo, packing light will make your trip that much easier and more enjoyable. Why add needless bulk and weight to your baggage with oversized bottles? Why risk a rogue tube of toothpaste squeezing open and making itself at home among the contents of your backpack? Make every ounce count by packing a travel kit, preferably one pre-stocked with TSA compliant sizes to cover all of your cleanliness needs. Breeze through security and customs and get on with the adventure! Convenience Kits Internationalâs conveniently designed travel kits feature TSA compliant sizes and their own sealable case to keep everything together. Theyâre easier to pack and faster to access and use when you need them. Check out the range of menâs travel kits, with handy shaving accessories, and also our top womenâs pick: the premium travel kit for women with a reusable clutch. Itâs a perfect addition for your purse collection when you get back home â what a bonus! We suggest doing some research before you go so you have a good starting point for some things you would like to do or places youâd like to see once you arrive. You donât want to be wasting too much time trying to figure out how you want to fill it. It can help to ease any initial anxiety youâre feeling about travelling alone by planning a one-day tour to get acquainted with a new area. The best way is to get out there and start. You never know what one activity or meeting one new person will lead to. Remember, itâs your time to be selfish and see absolutely everything you want to see! And that brings us to our next point â embracing the opportunity to be flexible. Itâs good to have a plan but if opportunity to try something different arises, a concert you would love to see is scheduled in the town you are in but planned to leave to get to your next destination stop, then by all means, stay and experience it! Thereâs no one to please but yourself, donât remain stuck in the regular patterns of your daily life. Expectations can be limiting on your adventures. They can either cause you to reject what you find because it isnât what you expected, or you may become disappointed by what you do try because you feel it âfalls shortâ. Donât limit your experiences by what you believe they should look like. Instead, be open to new places, trying different foods, approaching people more than you usually would, and absorbing the beauty of other cultures. If there was ever a time in life to be curious â weâre telling you, itâs now! Talk to as many locals as you can. As long as youâre being safe, feel free to flout the rule of ânever talking to strangersâ. They will help you uncover sights and experiences that you may not have heard of if youâd stuck to the regular tourist route. Locals can also help you learn new phrases so that you can also experience a different language. Or pack a Kindle sometimes you might need a little downtime. A book also makes for great company when you eat a meal by yourself. And you never know â it could be a conversation starter in itself! Consider this: an emotionally-safe trip will see you back home relaxed and content. On the other hand, a journey where you have the opportunity to confront a fear or even better, conquer it, will make sure you arrive home energized and proud. If you take nothing else away from this article, remember this: when you get on that first flight or train away from home, leave the word âcanâtâ behind. So, grab your travel kit, pack light but well and get ready to embrace one of the most empowering experiences of your life. Happy travels!